I’ve been working on myself this year, much of which has been chronicled in this blog! Now that we’re approaching autumn (not like you’d really know it with the south Florida heat still drenching me with sweat), motivation is a little tough. I find myself getting a little whiny and grumpy, because I want to reach the finish line. Are we there yet? Are we there yet? Are we there yet? Nope, Operation Tighten Up 2015 is for the WHOLE YEAR. That’s the thing about New Year’s resolutions. It means I am committing myself for a year to a goal of basically solving all my problems and making my life more streamlined and awesome (click for blog soundtrack). Yo, I’s gots this. Because, wouldn’t it be wonderful to have your entire life together: to feel really put-together, to look put-together, to make really smart decisions because distractions don’t exist. Getting my life on a narrow track was like pointing a laser beam of (love)light directly to a future of success. 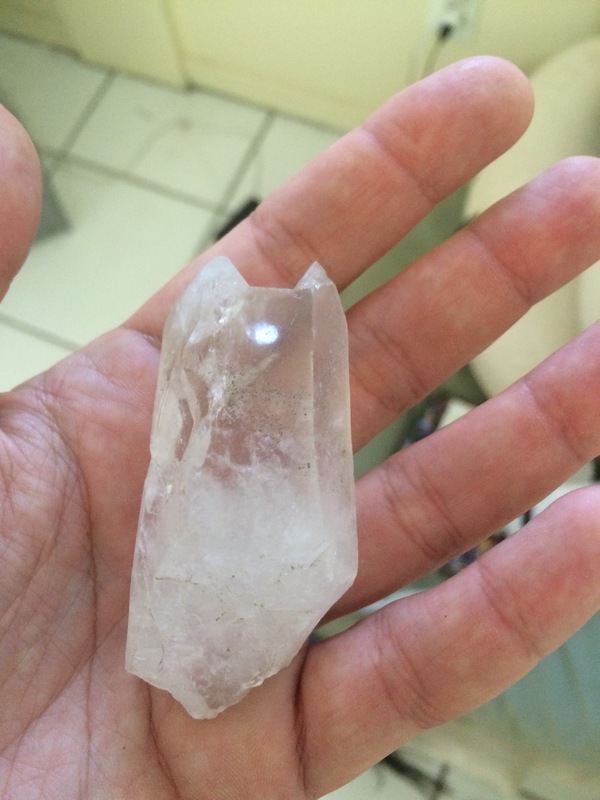 I have lost this crystal so many times, and it keeps coming back to me! The last time it took a walkabout, I found it months later at the bottom of my closet. Stoked! So, to back up , this life-changing undertaking started toward the autumn of 2014, when my new love and I were wining and dining, laughing and loving, partying and losing things, surfing waves and not caring about much else beyond each other’s eyes. It was fantastic! I had just finished months of fun traveling via airplane to visit fabulous friends, and I basically did everything on my 2014 vision board. Party! Pizza Party! But by the time 2015 rolled around, with its four nights of Phish in Miami, the vision that created that vision board started to blur. It was time, as they say, to tighten up. I embarked on the mission with full-force determination, first acknowledging that my 1,400-square-foot home was busting at the seams with stuff. I organized! It felt great! Things were so tight! And suddenly Operation Tighten Up 2015 kicked into high gear, as I agreed to move on to his sailboat and embark on a journey around the world! Weeee! I ended up selling all my possessions and, amazingly, actually getting my entire security deposit back on the rental home of the last eight years. I’ve been living on the boat now for a few months, and we’ve been super-busy getting her ready for our travels. And that’s when things got real. Operation Tighten Up 2015 wasn’t even CLOSE to being over. Know why? Because I needed to also tighten up my waistline. I needed to tighten up my career. I needed to tighten up my mind. I still needed to get it together, baby! Do we ever really have it all together? Those people who seem to … I don’t know, my guess is either they have a crew of professionals working for them or they are good at bluffing. Doesn’t it feel like there are always endless things on the to-do list? When is the car NOT messy? I don’t even have kids! Last month, I joined a gym for group training (holy crap, squats!). I started walking the bridges over the rivers. I stopped with the endless treats (boo!) and embraced healthy eating. I take naps. I drink a lot of water. I meditate and read Yogic texts. I spend a least an hour or two each day in front of the computer, working on freelance writing. And suddenly Operation Tighten Up 2015 is three-fourths finished. I am really ready to see signs of success. 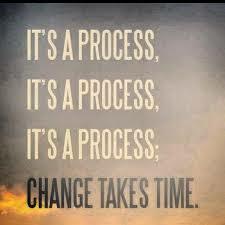 It’s important to remember that change is not a linear path. 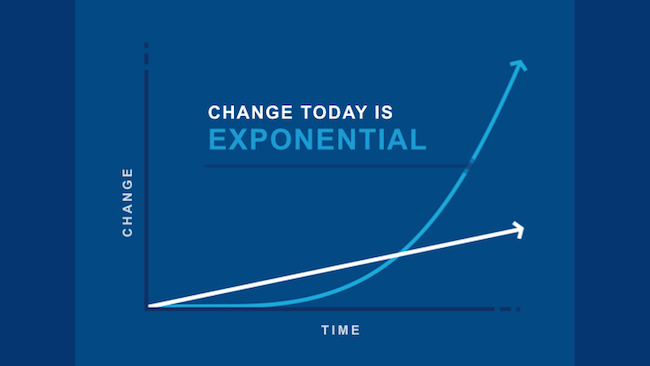 Change is exponential in nature, which means there is that point at which it feels like you’re even going backwards before, wham-o!, you shoot forward and realize your goals. We like to think it’s all Point A straight to Point B. That way we could look on our map and see, indeed, we are almost there. It’s not like that. Thanks to the Moonshot Moment of Indian River County, Fla. for first showing me this wonderful graph. Instead, when wallowing in an irritating plateau that comes right before the big leap toward success, we must look for signs of success along the way. OK, yeah: My things are gone and guess what? I don’t miss them at all. That was a success. I can do push-ups when a month ago I really didn’t think I could. (And, wow, Pam made my day this weekend by asking if I lost weight! No, the scale isn’t budging but I’m feeling stronger. That is a success.) I am in talks with a national magazine publisher who wants to run my feature story in the next issue. That is a success! And when people aren’t meeting my expectations, she writes nicely, well, I am working on adjusting my reaction. That is also a success. We still have a lot of work to do on the boat, but we’re getting there. I cleaned up all the dusty foam from the fire extinguisher. That was, indeed, a success. I’m ready to sleep in, instead of going to the gym in the morning. I’m ready for a big coconut milk ice cream sundae. I’m ready to lounge about on our sailboat, preferably off the coast of an island I’ve yet to visit. I’ll get there. I know I will. To change my paradigm from the whiny Are we there yet? kid to a successful adult, I’ve reinstituted my daily list of Ten Things I Am Grateful For. That’s a big number, and it forces you to dig deep. Sure, I’m thankful for cuddles from my furry companion and deep, real love from my boyfriend. By focusing on those types of things, I give them energy. I increase the numbers of things I am grateful for. I see more signs of success, because I am utilizing the help of my mind to solve my problems and Tighten Up. Meanwhile, anyone want to join me for Operation Big Fun? I don’t think I need to wait until the end of the year for that, and – believe this – I don’t think that is mutually exclusive of getting it together, either. Maybe it’s time to add fun to the current to-do list … right under “file blog entry”! If It Were Easy, Everyone Would Do It – The Lovelight Project on Livin’ the Dream! Copyright 2018 - All Rights Reserved by Suzanne Wentley.